2nd floor studio condo just steps to the beach. What are you waiting for? This unit has been freshly painted and updated with all new bright beachy decor, brand new smart tv and comfy cozy bedding. This gorgeous unit provides everything you need for a fantastic beach vacation. Just bring your bathing suit and a desire to enjoy yourself. This unit is literally a few short steps to the ocean. 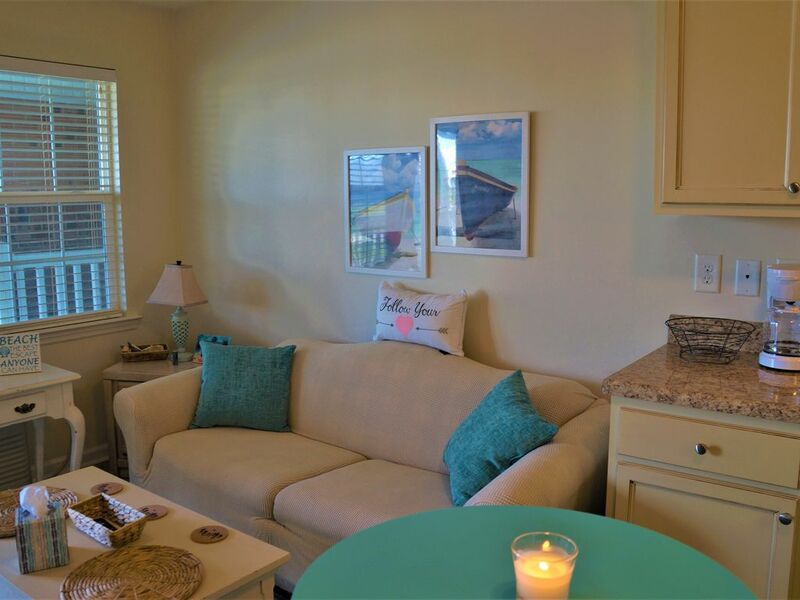 Grab your beach bag, sand bucket and shovel and go play on the beach during the day then relax in a tranquil setting at night that this unit will surely provide. Ocean Sands also has a pool for the "big kids" and a kiddie pool for the "little kids." Visit one of our fabulous local restaurants for dinner or prepare a meal in the unit with the full kitchen. You might even decide to grill out at one of the grills provided on the premises while listening to the relaxing sound of the ocean. We have put our hearts into this unit and we want you to feel the "love" when you walk in. This Jem books up fast so choose your dates and book your vacation today! NOTE: There have been a couple of guest who have brought to my attention that unit smells like someone has been in there smoking. Be advised, no one has been in actual unit smoking but there is a tenant that lives downstairs that does smoke and apparently the odor can come in through the wall sockets etc. It is not a very bad odor but for someone that is "sensitive" to smells it could be an issue. We want to make you aware of this prior to booking. This is a non smoking facility and the HOA is working on what we can do legally. This unit is just a few shorts steps from the ocean. You can walk out your front door and down the foyer to the ocean. Nice kitchen area fully stocked with cookware and dinnerware. This complex is ideally located to all things island with a convenience store across the street for incidentals. There's easy beach access and ocean view from the porch. The photos provided are an accurate visual description of the unit. As other reviews stated there is no clothing storage or closet for hang-ups and the WiFi is weak and inconsistent. The kitchen has basic supplies with nice pots and pans and two ovenware dishes. It lacks in food prep/serving dishes/mixing bowls and adequate cooking utensils. Based on others reviews we were surprised at the lack of cleanliness and the broken/no ack legs on the sofa and the broken sofa pull out. The floors were really dirty with cheerios under, behind and around the sofa and general lack of mopping. In route to the condo , we had to call for check-in information because we hadn't received any. After arrival we emailed with the mentioned concerns and received no response at all. We had to purchase a blow up mattress. We'd definitely stay at this complex again but probably not this unit. This condo was good for a quick weekend getaway. Quiet and peaceful. Close to anything you may want to do while in the area. Great place for a getaway. Very clean and tidy. Close to Morehead City and local restaurants. Beach access was perfect. We enjoyed our weekend in Atlantic Beach. This condo is in a complex right on the beach which is phenomenal, especially for the price. It’s an older complex so the exterior and pool areas have a lot of wear and tear. The condo is small but comparable to a typical hotel room. It was great for our family of four for a weekend. The beds weren’t super plush but also not as bad as I imagined based on other reviews. The place was clean and had the basics. Also, other reviews mention a smoky smell. I only noticed it when we first walked in. We ran the A/C unit and the two ceiling fans most of the weekend and I didn’t smell it any further. Our chief complaint would be that the wi-fi stinks. It did not have a consistent signal and I would strongly encourage the owners to make that easy fix. But overall we were satisfied (the proximity to the beach would make up for almost any problem, it’s just that close and gorgeous) and would consider staying in this unit in the future. I absolutely loved how close this unit is to the beach, literally steps away. Although when we arrived we were overwhelmed with the smell of cigarette smoke. We had to burn some candles to try to mask the smell during our stay. The shower head was a bit of an issue due to the very low-flow and hardly had any pressure to it, turns out all it needed was a slight adjustment and we got it to work just fine after. Despite these minor inconveniences, we truly enjoyed our stay. The location and price for this unit was well worth it. Condo unit was very nice, and clean when we arrived. Perfect location only steps from the beach. We had a great stay. Great for our small family. I would highly recommend this unit. You can't get any better in terms of location and price!